Use the following calculator to determine the rated capacity required by the sling(s). 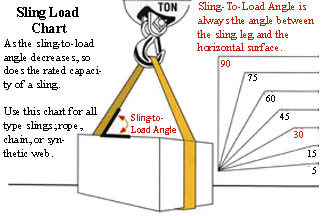 You will need a sling or slings with a rated capacity equal to or greater than the rated capacity required for the corresponding rigging technique. Minimum weight on each leg: 0 lbs. Maximum weight on each leg: 0 lbs. Minimum Rated Capacity Requred: 0 lbs. Determine the load factor by observing the load factor chart below. Ex. Assume that the leg angle will be 60°. The load factor for 60° from the load factor chart is 1.154. Multiply the load factor times the minimum weight to be supported by the leg, i.e. 1,000 pounds times 1.154=1154 pounds. The rated sling capacity needed is then 2,308 (1,154x2) pounds in basket capacity to safely lift the 2,000 pound load.